I spent the whole morning at the San Diego Zoo but didn’t run into any cows or other bovines there (our focus today was more on lizards and other members of the reptile family). Tonight with my kids I read one of the books I picked up at the library yesterday called “The little rabbit who liked to say Moo” by Jonathan Allen. The cow character appears on almost every page. Very cute story. What I found most striking on this ad is the use of not one, not two, but three bulls on one page! Now, if you know anything about advertising, you know about the Z pattern, where you put the most important stuff on specific areas of the page, where our trained eyes spend most of their time pausing. Precisely like this: upper left corner, upper right corner, lower right corner. 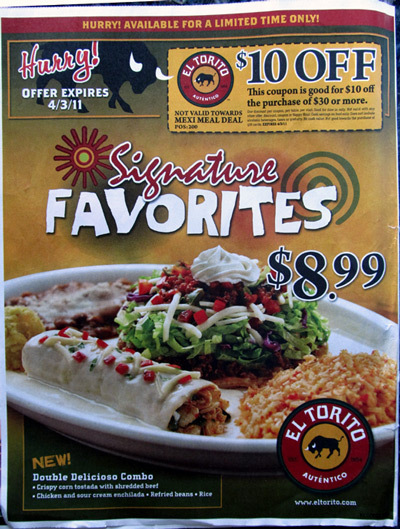 Obviously the agency El Torito uses has done their homework – kudos to them! You’ll let me know wha you think but in my opinion the three bulls are overkill. Do I really need to see the giant bull logo on the upper left corner and right next to it, the giant logo on the coupon? But who am I to complain? El Torito gave me the triple cow effect in one single page, and this doesn’t happen every day! Previous Post Cow creamers are back in fashion! Next Post Tailgaters beware – this is no ordinary bull! I agree, kind of overkill but it probably works!